Do you use a oil filter? Is it REALLY beneficial to add an oil filter to a stock 1600 engine? I have an aftermarket motorcycle filter assembly on the pan, but I hate that thing since it is a huge target for a rock. Full flow is an option, but is it really beneficial with the tolerances and thick oil used in these engines? Always BLACK! Has anyone ever had these full flow filter assemblies fail (oil hose, filter, ect)? Trying to decide the trade-offs. Any experiences and information welcome. I love learning all I can from those that have experienced failure and what was done to reduce the risk. starting and high idle in cold weather will blow up a oil filter, lines ECT. the stock VW mtr will not buy pass thick cold oil. if you run a ext filter your motor will last longer. if you keep the oil under 180 deg. it will last longer. 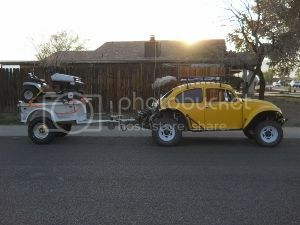 with a stock 1600cc I could get 3-4years out of it in AZ. same block ... full flowed with the dog house + Ext oil cooler, and filter. the oil never got over 180 deg. was still running strong after 13 years... I turned it into a 2110cc ran it hard for 1 year, turbo-ed for 2years then I sold it to a guy with a 71 bus that wanted to do 80mph all day long. I was told that you don't need to run a real oil filter because of the mechanical lifters.. if you put in hydraulic lifters you will need to run a better oil filter. Agreed with Dalton. They say that the oil pump filters are junk! Has too much resistance in the pump/filter body. I always recommend a full flow set up, unfortanitly the case has to be dissesembled to do it properly. Go to Gene Berg.com a lot of good reading. good luck and look foward to seeing you out on the trails! Thank you for the info Dalton and azdesertrat87. Very interesting what Gene Berg has to say (no BS) on every topic. If you were at the river run, I was the new guy (Steve) in the white baja with my bother-in-law (Tony). oh ya glad you had fun, there a great bunch of people, look foward to seeing you out on the trails!